After a long, strange day and evening, tonight just seemed to call for wine and cheese. It would be a relaxer, a way to slip into the evening rather than be thrust into it with no adjusting timeline. So I made it be so. 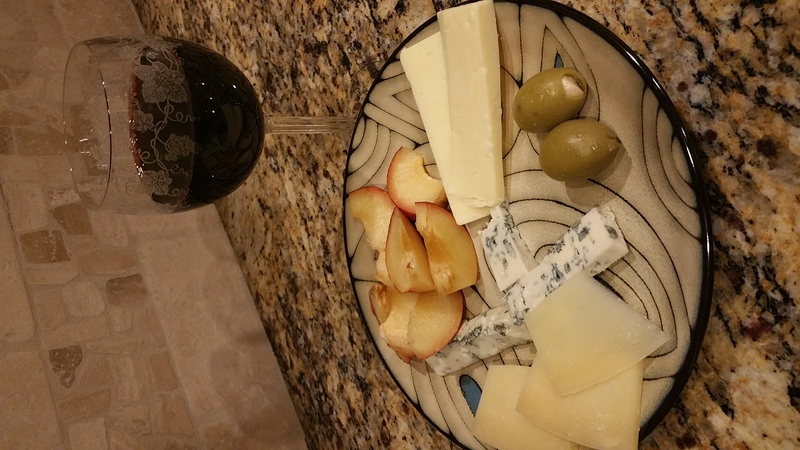 Here’s bleu cheese, parmesan, and white cheddar accompanying a sliced plum and a nice fat olive. With a glass of cabernet sauvignon. I enjoyed it. And I enjoyed the occasional calls that had no voice on the other end of the line. I did not enjoy the sound, tonight, of acorns raining down on the deck in rapid-fire fashion. Before we left for our engagement late this afternoon, I used the lawn blower to remove all the leaves and acorns from the deck. A short while ago, the rain of acorns was incredibly loud. I suspect my work was for naught. Notwithstanding the acorns, I do love the forests here.